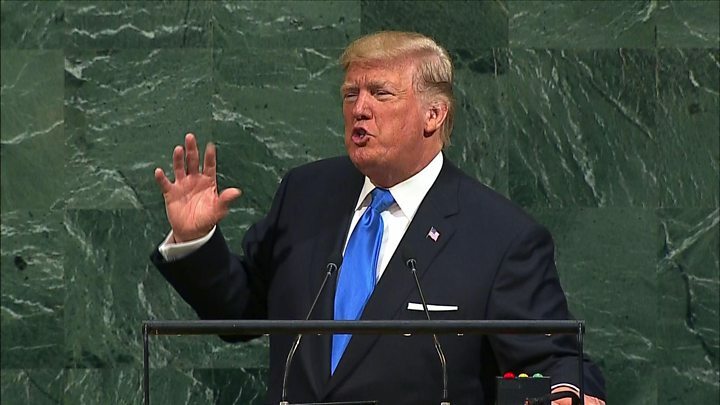 Image caption Mr Trump has taken to calling Kim Jong-un "rocket man"
Speaking to the UN General Assembly on Tuesday, Mr Trump said he would "totally destroy" North Korea if it posed a threat to the US or its allies. Foreign Minister Ri Yong-ho's comments were North Korea's first official response to the speech. Mr Ri told reporters near the UN headquarters in New York: "There is a saying that goes: 'Even when dogs bark, the parade goes on'." "If [Trump] was thinking about surprising us with the sound of a barking dog then he is clearly dreaming." Speaking about North Korean leader Kim Jong-un, Mr Trump had told the UN: "Rocket man is on a suicide mission for himself and his regime." When asked what he thought of Mr Trump calling Mr Kim "rocket man", Mr Ri responded: "I feel sorry for his aides." 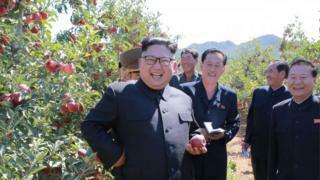 The decision comes days after the UN approved new sanctions against Pyongyang, restricting oil imports and banning textile exports - an attempt to starve the North of fuel and income for its weapons programmes. The UN sanctions came in response to the North's latest nuclear test on 3 September.